DeStefano finds a fresh take on the events that lead to Easter. 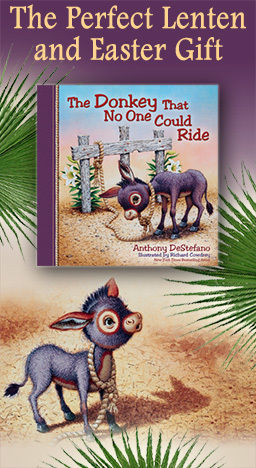 Using a small scriptural reference to the unridden donkey that Jesus rides in triumph into Jerusalem, DeStefano imagines a transformative relationship between a small, weak donkey and a figure who gives him strength and asks him to have faith. The text’s rhymes (“No matter how much he tried or he cried/ This was a donkey no one could ride”) make for easy read-aloud. Cowdrey’s illustrations focus on the donkey, conveying the development from initial lethargy to the donkey’s energetic and confident strength. It’s a welcome change from Easter chicks and bunnies. Ages 5–up. 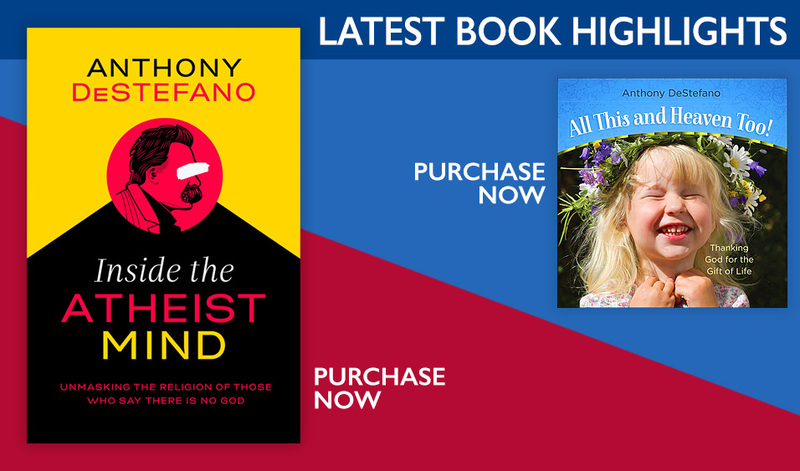 "Anthony DeStefano brings to life "the hidden world God has created for us," a world that surrounds us but is difficult for even the most convinced Christian to get in touch with, much less the seeker or non-believer. And he does this in a more vivid and realistic way than I would have thought possible. Angels, devils, and grace? DeStefano makes them almost visible. This is a wonderful, compelling book, completely consistent with traditional Christian teaching and common sense – and very, very readable." "I may not always agree with Anthony DeStefano, but there is no doubt he is a highly intelligent and witty writer; and assuming the existence of an invisible world, he has produced a very interesting and thought-provoking book about spirituality." "Sadly, many people today are so materialistic in their thinking that they've forgotton that the most important things in life are unseen and spiritual. Love, honor, compassion, forgiveness, hope–All of these are invisible. Finally, there is a book that makes the whole invisible spiritual world come to life in the most extraordinary and vivid way. Anthony DeStefano's words will inspire even the most hardened and materialistic cynic to begin exploring a richer, fuller life based on faith in a God who is so good." "Have you thought about Heaven lately? Wonder what it's like? How you can get there? A Travel Guide to Heaven explains it all. And while it may be your final destination, it will be the best trip you ever took!" "This Little Prayer of Mine is the springboard for helping children to establish that type of lifelong relationship with our heavenly Father." "Why are some of our prayers answered while some are not? In a simple, straighforward style, Anthony DeStefano takes on the mysteries of prayer. He casts a wide net to appeal to all Christians everywhere without compromising the gospel one iota. Read Ten Prayers God Always Says Yes To... This book could revolutionize your prayer life." "Anthony DeStefano has once again drawn his readers into the mystery of God's love and invited us to reflect more deeply on our relationship with Him. In a simple yet profound way, Ten PRayers God Always Says Yes To, offers insights, and indeed a practical wisdom, that will resonate with anyone who has ever struggled with personal prayer. I recommend this book to any and all who are searching for a fresh perspective on the meaning and value of a life of prayer, and, ultimately, for a more fulsome encounter with the Living God."